In the year 1902, fourteen year old Horace Salmon went to work in a mercantile store in St. Johns, Antigua to supplement the family income. His father, Frank Salmon, was struggling to make ends meet during a decade-long depression that affected all of the West indies and some people were starving to death. Frank’s job as Caretaker of Nelson’s Dockyard had come to an end and he had moved his family from English Harbour to a little house on Nevis Street near Country Pond in St. Johns. One can imagine that Horace began as a stock boy loading and unloading trucks of merchandise and putting items on the shelves. Doubtless as he became familiar with the products, he helped customers make their selections and began learning the craft of salesmanship. 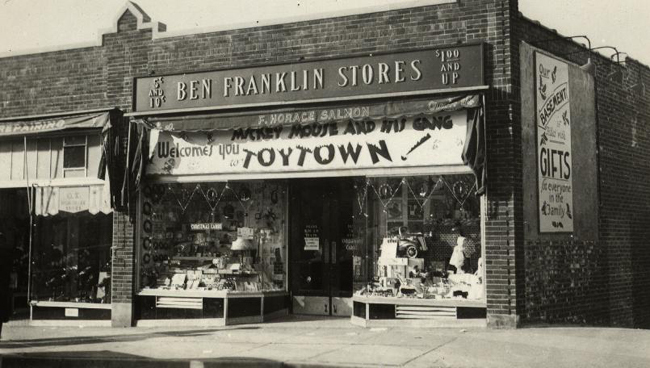 All of the stores in that little capitol city bore the names of their founders and owners, proudly displayed in large letters above the entry way. So, it is understandable that young Horace Salmon might feel that it would be wonderful one day to own his own retail business and thus make a name for himself. This is a twelve page biography with countless illustrations, telling the story of my father, Francis Horace Lionel Salmon (1888-1951). It is one of several biographies in the Salmon-Stephens Family website (www.richsalmon.com). 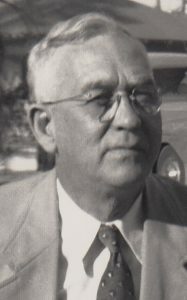 Horace was born in Antigua in the British West Indies on April 28, 1888 to James Frances Nelson “Frank” Salmon (1841- 1909) and Deborah Alice Lake Salmon (1863-1943). After working in a mercantile store as a teenager, Horace emigrated to the USA and settled down in Chicago where he went to work as a clerk in the Jewelry Dept of Marshall Fields Department Store. He sent $3.00 of his $9.00 weekly salary back to the family in Antigua. In 1909, Horace accepted a job with Fred Harvey Company in Albuquerque NM, as buyer for their Indian Stores in the train stations across New Mexico, Texas and Arizona. 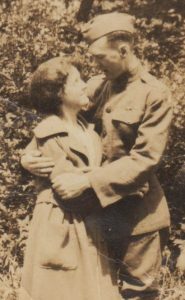 World War I caused the U.S. Army to draft soldiers from all walks of life, including foreigners, and Horace reported for duty in the trenches of France during the final months of the war. Returning afterwards to New York City, he got a job selling rugs at R.H.Macy’s Department Story in Manhattan, living with his mother and sister who had emigrated there after the death of his Dad. Horace met and soon married (June 18, 1921) Carrie Elisabeth “Betty” Doig, a school teacher whose father, Will Doig (1867-1902), had been born in Antigua . Betty’s mother was from a Maryland family of Methodist preachers and farmers. They first settled in an apartment in Jersey City, but before long had an urge to move South where the weather would be warmer. 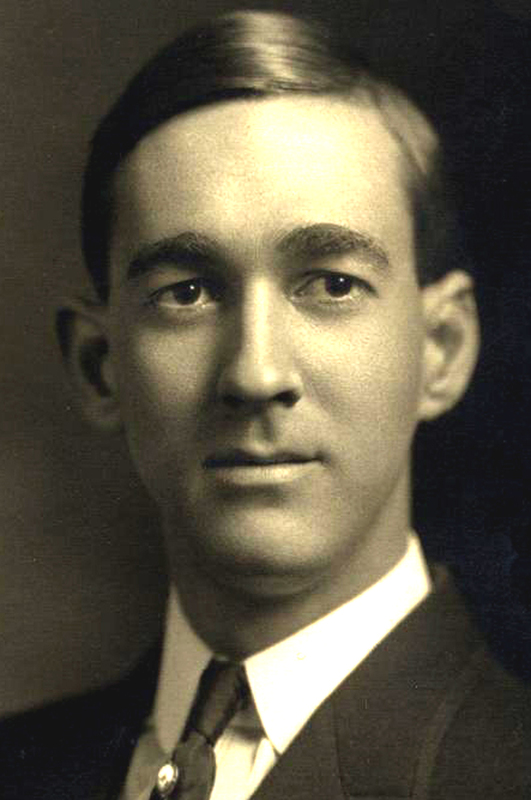 Horace got work in Richmond, Virginia and Betty gave birth to William Horace Salmon on March 14, 1924. 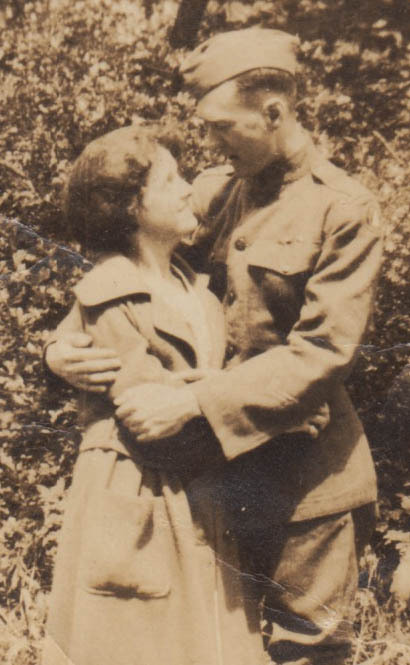 With the extended family of transplanted Antiguans growing in New York City, the young couple left Virginia within a year and went to Rutherford NJ where Betty’s mother lived. After another year, son F. Howard Salmon (1927-2009) was born, and the family moved to Trenton NJ, away from the bustle of the New York metropolis. Mr. Salmon sold rugs for H.M.Voorhees and joined the Grace Baptist Church. Horace moved his family across the Delaware River to Morrisville PA where Elisabeth Lee “Betsy” Salmon was born in October 1930. Richard Farley “Richie” Salmon was born later on February 8, 1935. Bill and Howard started school there and developed many friendships. 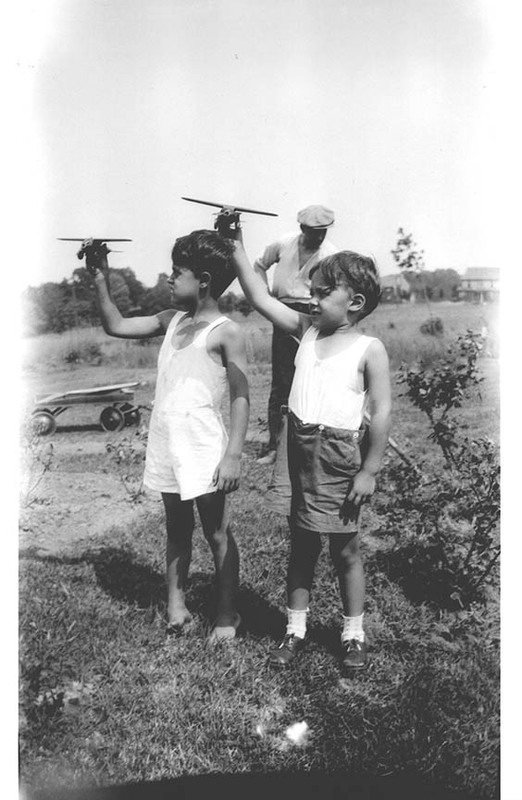 The boys grew very fond of model airplanes and Horace took Bill for a ride in a Curtis Condor B-2 Transport. Bill eventually became a WW2 bomber pilot. In 1936, Horace moved his family to 65 Highview Avenue in Bernardsville NJ where he and Betty opened a Ben Franklin 5 and 10 cents Store. 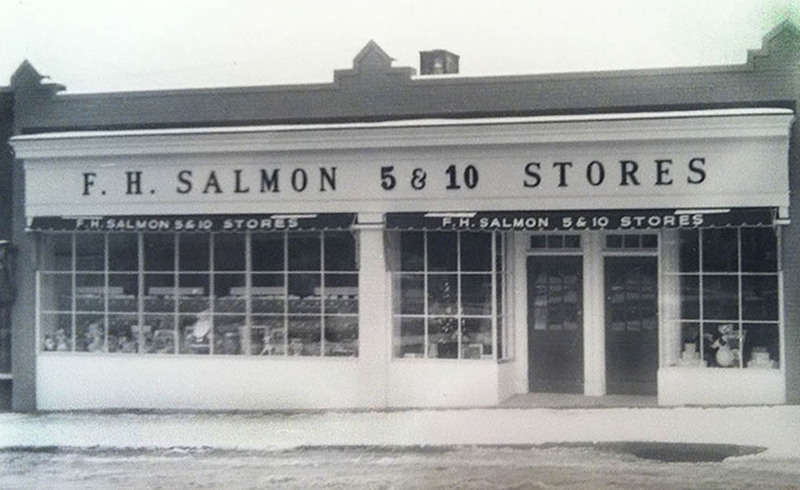 It was later renamed the F. H. Salmon 5 & 10 Stores. 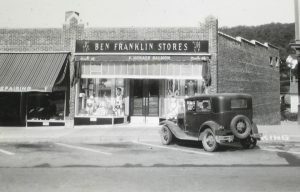 Eventually, they opened other stores in Bedminster, Peapack, Denville and Boonton NJ and two 1937 Ford station wagons were purchased to distribute merchandise among them. World War II took away oldest son Bill right out of High School in 1942 and he became a bomber pilot, flying with the 15th Army Air Force out of Foggia in southern Italy. Howard joined the U.S. Navy after High School and was stationed in Bermuda after the war, repairing radios. When he returned from the service, Howard finished a B.S. in Electrical Engineering at Newark College of Engineering and then went to work for his Dad in the stores. Bill on the otherhand went to Roosevelt Aviation School in Long Island, fixed planes for Lockheed, and eventually made a career with the New York Telephone Company in Manhattan. Betsy finished a college degree at Lycoming College in Pennsylvania and Richard completed a B.A. degree in Bible at Abilene Christian College (in 1956) five years after Horace’s death. Heavy smoking took its toll and in the Fall of 1951, at age 63, Horace died of heart disease and was buried in St. Bernards Cemetery in nearby Basking Ridge NJ. Betty and Howard took over the store business and it provided a decent living for Betty for the rest of her life, dying in August 1972. To read the entire story, click here for the first chapter. Site maintained by Richard F Salmon.